Where Can You Purchase Products for The Secret Fire? 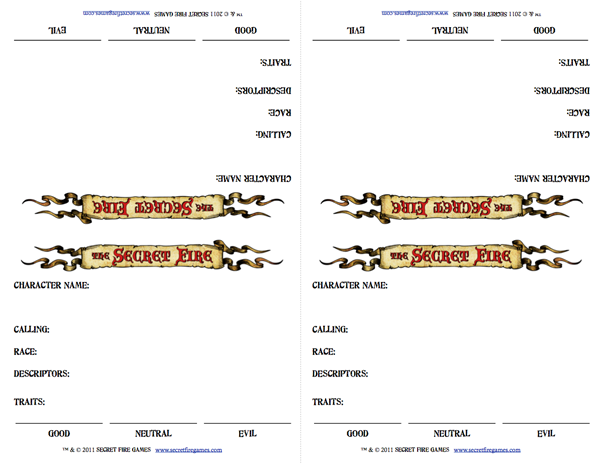 The Secret Fire rulebook contains all the information you need to run a Secret Fire game. The dimensions of book (8.5 x 5.5 inches) make it a great size for your game table as well as your tablet device (unlike standard size 8.5 x 11 inch books, the pages aren’t shrunken down when displayed on screen, making the book easy to read and reference during game play). The hard-copy print edition of The Secret Fire RPG is available from Lulu.com. 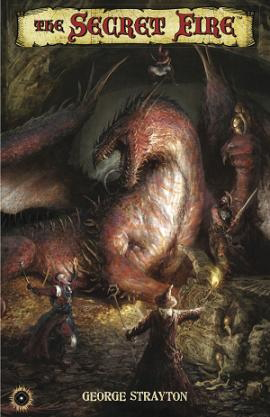 The book-marked digital version of the Secret Fire RPG PDF is available from DriveThruRPG.com. The ePub is available from the Barnes & Noble Nook store. This 6-page, printable screen for The Secret Fire RPG enables Master Creators (MCs) to keep the secrets of the game hidden from the players and provides a quick reference to commonly needed material for both MCs and players alike. Note that the PDF is large (approximately 100 meg) to retain the highest print-quality possible. Pages can be printed out and inserted into generic game master screens available at local and online hobby stores or clipped to screens from other RPGs for use during Secret Fire game sessions. You can also save each of the six pages as a 72dpi jpeg for use on iPads, iPhones, or other tablet or mobile devices. In addition, the file was created for full-page bleed, so depending on your printer, you may have to shrink it to around 95%. The printed version of the MC screen is currently only available at game conventions. Due to popular demand, Secret Fire Games brings you Official Character Tents to make your Secret Fire™ game even faster, easier, and more immersive. Put all the important information about your PC on this foldable “character tent.” Simply print, cut along the dotted line, fill in both sides with your PC data (so others players can see your information from any angle around the table), fold in half, and stand up in front of you, giving everyone instant access to the basics of your character: Name, Calling, Race, and especially Descriptors and Traits, which others can use to roleplay with you, earning both of you Energy Points, the main engine of The Secret Fire. Or, if you’re the Master Creator, print these tents for your players so you’ll have ready access to their characters’ Descriptors and Traits, using them to tempt the characters toward their potential destiny or doom. Then watch the Energy Points fly fast and furious around the table! Printing on cardstock makes for sturdier tents, but you can instead use a normal-weight 8.5 x 11 sheet of paper and fold up your tent along the dotted line (rather than cutting) to give added standing power to your tent.